Josephine St. Pierre Ruffin (August 31, 1842 – March 13, 1924) was an African-American publisher, journalist, civil rights leader, suffragist, and editor of the Woman's Era, the first newspaper published by and for African-American women. Ruffin was born in Boston, Massachusetts, to John St. Pierre, of French and African descent from Martinique, and Elizabeth Matilda Menhenick from Cornwall, England. Her father was a successful clothier and founder of a Boston Zion Church. She attended public schools in Charlestown and Salem, and a private school in New York City because of her parents' objections to the segregated schools in Boston. She completed her studies at the Bowdoin School (not to be confused with Bowdoin College), after segregation in Boston schools ended. Ruffin supported women's suffrage and, in 1869, joined with Julia Ward Howe and Lucy Stone to form the American Woman Suffrage Association (AWSA) in Boston. A group of these women, Howe and Stone also founded the New England Women's Club in 1868. Josephine Ruffin was its first bi-racial member when she joined in the mid-1890s. Josephine also wrote for the black weekly paper, The Courant and became a member of the New England Woman's Press Association. When her husband George died at the age of 52 in 1886, Josephine used her financial security and organizational abilities to start the Woman's Era, the country's first newspaper published by and for African-American women. She served as the editor and publisher from 1890 to 1897. While promoting interracial activities, the Woman's Era called on black women to demand increased rights for their race. In 1894, Ruffin organized the Woman's Era Club (later called the New Era Club), an advocacy group for black women, with the help of her daughter Florida Ridley and Maria Baldwin, a Boston school principal. 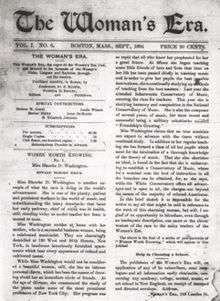 In 1895, Ruffin organized the National Federation of Afro-American Women. She convened The First National Conference of the Colored Women of America in Boston, which was attended by women from 42 black women's clubs from 14 states. The following year, the organization merged with the Colored Women's League to form the National Association of Colored Women's Clubs (NACWC). Mary Church Terrell was elected president and Ruffin served as one of the organization's vice-presidents. Just as the NACWC was forming, Ruffin was integrating the New England Woman's Club. When the General Federation of Women's Clubs met in Milwaukee in 1900, she planned to attend as a representative of three organizations – the New Era Club, the New England Woman's Club and the New England Woman's Press Club. Southern women were in positions of power in the General Federation and, when the Executive Committee discovered that all of the New Era's club members were black, they would not accept Ruffin's credentials. Ruffin was told that she could be seated as a representative of the two white clubs but not the black one. She refused on principle and was excluded from the proceedings. These events became known as "The Ruffin Incident" and were widely covered in newspapers around the country, most of whom supported Ruffin. Afterwards, the Woman's Era Club made an official statement "that colored women should confine themselves to their clubs and the large field of work open to them there." The New Era Club was disbanded in 1903, but Ruffin remained active in the struggle for equal rights and, in 1910, helped form the National Association for the Advancement of Colored People. Ruffin was one of the charter members of NAACP. Along with other women who had belonged to the New Era Club, she co-founded the League of Women for Community Service, which still exists today. Ruffin married George Lewis Ruffin (1834-1886), who went on to become the first African-American male graduate from Harvard Law School, the first African American elected to the Boston City Council, and the first African-American municipal judge. Josephine and Ruffin were married in 1858 when she was 16 years old. The couple moved to Liverpool but returned to Boston soon afterwards and bought a house in the West End. They had five children: Hubert, an attorney; Florida Ridley, a school principal and co-founder of Woman's Era; Stanley, an inventor; George, a musician; and Robert, who died in his first year of life. The couple became active in the struggle against slavery. During the Civil War, they helped recruit black soldiers for the Union Army, the 54th and 55th Massachusetts regiments. The couple also worked for the Sanitation Commission, which provided aid for the care of soldiers in the field. She died of nephritis at her home on St. Botolph Street, Boston, in 1924, and was buried in Mount Auburn Cemetery, Cambridge. Her home on Charles Street is a site on the Boston Women's Heritage Trail. 1 2 Lyman, Darryl (2005). "Josephine St. Pierre Ruffin". Great African-American Women (third ed.). Middle Village, NY: Jonathan David Company. pp. 196–197. ISBN 0-8246-0459-8. Retrieved 2008-09-15. 1 2 3 4 5 State House Women's Leadership Project (2008). "Josephine St. Pierre Ruffin". Massachusetts Foundation for the Humanities. Archived from the original on May 9, 2008. Retrieved 2008-09-12. ↑ "Josephine Ruffin, Activist, Philanthropist and Newspaper Publisher". African American Registry. ↑ Neal, Anthony W. (February 3, 2016). "Josephine St. Pierre Ruffin: A pioneer in the black women's club movement Part 1". The Bay State Banner. ↑ "COLORED WOMEN IN CONFERENCE; National Association for Their Betterment Formed in Boston". The New York Times. July 29, 1895. ↑ Stephanie Knight, "George Lewis Ruffin", Black Past, accessed April 14, 2012. ↑ Mitchell, Verner; Davis, Cynthia (2011). Literary Sisters: Dorothy West and Her Circle, A Biography of the Harlem Renaissance. Rutgers University Press. pp. 85, 89–90. ISBN 9780813552132. ↑ James, Edward T. (1971). Notable American Women, 1607-1950: A Biographical Dictionary, Volume 2. Harvard University Press. p. 207. ISBN 9780674627345. ↑ "Beacon Hill". Boston Women's Heritage Trail. Indiana Commission for Women (2003). "African American Women In History: Josephine St. Pierre Ruffin (1842-1924)". State of Indiana. Archived from the original on 2005-02-09. Retrieved 2008-09-12.